Length 20-27mm. C. semilaeve, as C. affine and C. simplex, has an elytral sculpture with flatten intervals and striae indicated by superficial punctures only. The color in the three species is dull black. C. semilaeve is easily distinguished by the strongly transverse pronotum and by the sculpture of elytra with clearly scaly intervals, especially at humeri. It lives in the southwestern United States: Arizona, California, Idaho, New Mexico, Oregon, Utah, and it should be present in Guadalupe island, off the coast of Baja California (Mexico). 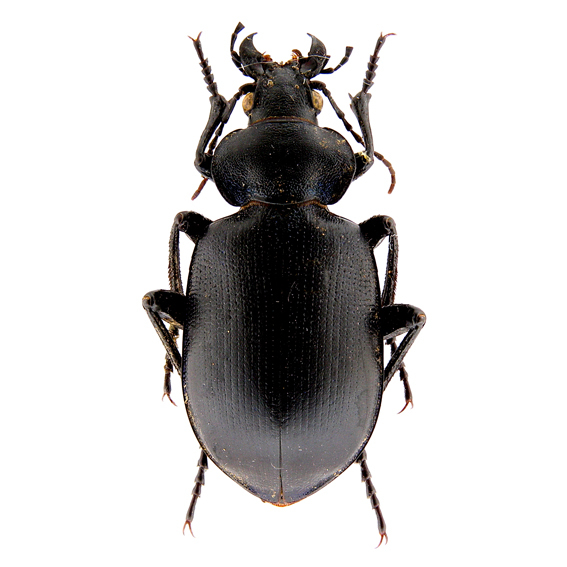 Following its importation as a potential agents of biological control into Hawaii, C. semilaeve have been also cited as part of the entomological fauna of the Islands (http://www2.bishopmuseum.org /HBS/checklist). Notes: Winged. It is found from lowlands to midlands up to 1300m altitude, on open ground and tilled fields. It is diurnal as well nocturnal and feeds on caterpillars, cutworms (Elateridae larvae) and other ground-inhabiting larvae (Burgess & Collins 1917: 91). Specimens of C. semilaeve were imported from Ventura County, California, and liberated at Waikii, Hawaii in 1923 in order to control the infestations of Lepidoptera Noctuidae (Funasaki & al., 1988: 113). The adults are active in April-May but they can be found up to December. A brief description of larval stages can be found in Burgess & Collins (1917: 92). United States: California, Los Angeles, Santa Monica mountains, 16.IV.83 Baierl lgt.